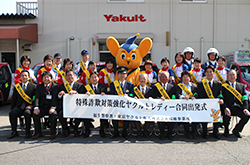 Local Communities | Yakult Honsha Co., Ltd. Since 1972, the Yakult Ladies have been carrying out “Courtesy Visit Activities” which entail checking on the well-being of elderly people living alone and chatting with them while delivering Yakult products. Her initiative resonated with both the local Yakult marketing company and social workers in the region, and further moved many local governments to take action. As a result, these visits by Yakult Ladies, known as Courtesy Visit Activities, have spread throughout Japan. Courtesy Visit Activities have been held in high esteem by people engaged in volunteer work and by the government, and received a special prize for outstanding corporate communication from Keizai Koho Center (Japan Institute for Social and Economic Affairs) and the Minister of Health and Welfare Award for volunteer contributions. 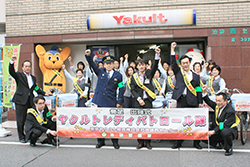 Being well positioned to observe every corner of their sales areas during daily delivery rounds, Yakult Ladies contribute to communities’ safety and peace of mind by participating in crime watch and other activities undertaken in cooperation with 828 local governments and police units as well as other local organizations around Japan. As a result of these activities, there have been cases where Yakult Ladies have felt something was not normal at a customer’s residence and reported it to the police, who have found and rescued the person. As of March 2018, 103 marketing companies* throughout Japan have created organizations to contribute to communities’ safety and peace of mind. 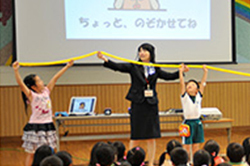 The Yakult Group dispatches guest lecturers mainly to elementary schools, where they use scale models and other instructional tools to provide easy-to -understand information about the important role of the intestines and the importance of healthy eating habits conducive to good bowel functions. The Pink Ribbon campaign is a breast cancer awareness campaign that started from a ribbon made with the wish of a patient’s family who died of breast cancer in the United States "to prevent such tragedies from being repeated." Yakult supports the Pink Ribbon campaign through J.Posh. Aiming to deepen friendly relations with local communities, we annually organize festivals at our plants and invite the members of local communities to participate. During fiscal 2017, six Yakult Honsha plants including our pharmaceutical plant and five bottling companies held festivals, which a total of about 25,000 people attended. In addition, with the objective of deepening understanding of Yakult’s products and the Group’s commitment to environmental awareness and products that are safe and offer peace of mind, we proactively offer tours of each plant. We offer plant tours to members of the general public ranging from children to the elderly as well as such programs as sociology and environmental education programs for elementary school students, and we also seek to use such tours to obtain feedback information from opinion leaders and people with a particularly strong interest in health issues. Kidzania is an experience amusement park where childeren can enjoy work experiences in real life-like facilities such as shops, banks, police stations and fire departments. Children choose the work they want to try and learn about society while having fun. Yakult operates the “Science Lab” pavilion, where children can learn in an enjoyable manner. Yakult Hall is a multipurpose venue hall located at the Company’s headquartersin Shimbashi, Tokyo. 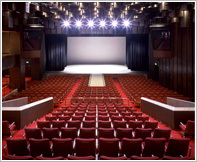 Used for concerts, film previews, lectures, etc., Yakult aims to promote the arts and culture through the operation of this hall.